Washington State is the only perfect ATS team remaining in college football, but off an emotional home win over Oregon, can Wazzu rally again to win at ranked Stanford? Washington State is the only perfect ATS team remaining in college football, but off an emotional home win over Oregon, can Wazzu rally again to win at ranked Stanford? 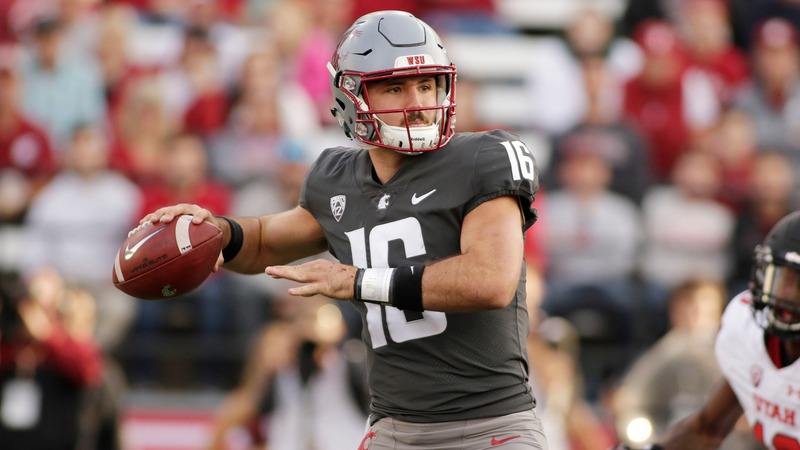 Washington State QB Gardner Minshew has been the story of Wazzu's perfect ATS run, as he has thrown for 2,745 yards and 23 TDs in Mike Leach's Air Raid offense. Minshew has a great matchup against a Cardinal defense that is ranked 93rd in passing completion rate and was gashed for 346 yards by Oregon QB Justin Herbert. But the key for Washington State's success on Saturday will be between the trenches. Yes, Bryce Love (348 rushing yards in five games) has battled injuries this season, but the Cardinal's offensive line has struggled mightily. Stanford is 123rd in the nation in rushing opportunity rate and 125th in stuff rate. The lack of a run game has led coach David Shaw to rely on his jump-ball passing game to JJ Arcega-Whiteside and Trenton Irwin. The Wazzu defense has to be excited about this matchup, knowing they are 32nd in stuff rate, 18th in sack rate and 10th in defending passing efficiency. Facing a Utah defense with similar metrics earlier this season, Stanford was crushed at home, 40-21. __MORE:__ [Sharps backing Notre Dame](https://www.betchicago.com/notre-dame-navy-betting-lines-trends-stats-ats-total-prediction) | [Prop out for Tua winning Heisman, Tide getting national title](https://www.betchicago.com/alabama-prop-tagovailoa-heisman-national-championship) ## Washington State at Stanford betting lines __Point spread:__ Stanford -3 __Total:__ 53.5 __Line movement:__ The Westgate opened Stanford as a 3.5-point favorite, but the point spread dropped to 3 within an hour after betting opened. Stations Casino in Nevada opened Stanford -4 and also quickly went to -3. __S&P+ prediction:__ Washington State 31, Stanford 30 __Note:__ S&P+ rankings are an advanced data set of tempo- and opponent-adjusted components of the five factors of college football: Efficiency, explosiveness, field position and finishing drives. Per creator Bill Connelly, a fifth factor, turnovers, is informed marginally by sack rates. ### Washington State betting overview 2018 SU record: 6-1 2018 ATS record: 7-0 2018 O/U record: 5-2 S&P+ rank: 24 Off. S&P+ rank: 16 Def. S&P+ rank: 63 Special Teams S&P+ rank: 56 The Cougars lead the nation in passing with 400.7 yards per game and now get a Cardinal defense ranked second-to-last in the Pac-12 in passing yards per game allowed (252.1), even though it has conceded only seven passing touchdowns. WSU RBs James Williams and Max Borghi have combined for 11 TDs on the season and shouldn't have any trouble punching another one in against Stanford's defensive line that is 119th in havoc rate (tackles for loss, passes defensed and forced fumbles divided by total plays). ### Stanford betting overview 2018 SU record: 5-2 2018 ATS record: 4-3 2018 O/U record: 4-3 S&P+ rank: 43 Off. S&P+ rank: 52 Def. S&P+ rank: 42 Special Teams S&P+ rank: 40 A win over then-No. 17 USC and a miracle victory over Oregon had the Cardinal has high as 7th in the AP Poll before back-to-back crushing losses to Notre Dame and Utah. Stanford held on for a road win over Arizona State but hasn't been impressive of late. With the offensive line a mess, QB K.J. Costello has been keeping his team in games with explosive plays and a solid 64.5 completion percentage. Coach Shaw isn't doing Costello any favors as the team is 129th in havoc rate allowed and 130th in adjusted pace. The offense lacks creativity and will be exposed on Saturday and again next week at Washington. ## Washington State at Stanford betting trends --Washington State has won the last two and covered the past three against Stanford. --Washington State 13-4 ATS in its last 17 regular-season games. --Stanford is 5-9 ATS as home chalk since 2016. --UNDER is 10-2 in Stanford's last 12 games as a favorite. --Cardinal are 4-10 ATS in their last 14 games following a ATS win.